← Blackpool Brush car 623 relaunched in style! Today’s Picture in Time image comes from the Seaton Tramway and features two trams which although remain in Devon to this day remain stored in Riverside Depot. The two trams in question are double decker no. 7 and Mobile Shop 01 which are both seen at the old Seaton terminus before it became the Victorian terminus we know today. We have looked at the history of no. 7 numerous times in this series but at the time of this photo – taken in August 1976 – it was carrying a green livery with its lower end saloons notable in this view. Of more interest for this series is that alongside is Mobile Shop 01 which was vital for the tramway before a permanent shop was built at Seaton. The origins of this car are from 1960 when it was initially a flat bed works car before being converted to a shop initially motorised as in this view. The motors were later removed and it had to be towed to and from Seaton on a daily basis before it became redundant in 1995. At this time it was converted again, this time as a ganger’s car but this was not the last change for the vehicle with it being used briefly as The Tram Shack at Seaton providing refreshments but it too is now stored at Riverside Depot seemingly with no future role on the tramway. 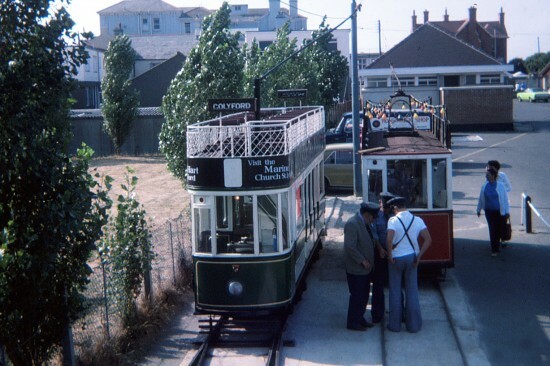 This view is taken at Seaton terminus from the top deck of another tram in August 1976 with tram crews looking as if they are discussing their next moves. This entry was posted in Picture in Time, Seaton Tramway. Bookmark the permalink.